I first reviewed this book in 1997. I have always liked Baxter. I’ve even been to his former church in Edinburgh. 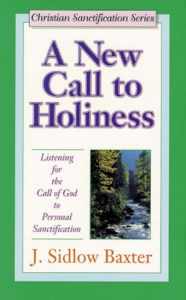 As I pointed out in my earlier review, Baxter refutes the holiness teaching of the eradication of the old nature and therefore the believer always having only one nature, either sinful or holy. He does believe that we have only one nature but that nature is always the same nature, once separated from God and in a lost condition, now, after salvation, renewed and given fellowship with God. Baxter retained a view that the believer does need a further dedication to God after salvation (not a second blessing he insists) in order to live fully in the Spirit. Besides these differences, I think the bulk of the book is still a valuable read for anyone wanting a closer walk with God.